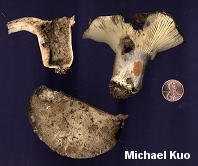 Russula densifolia is a blushing russula found throughout North America, featuring a whitish cap that soon becomes brown, and close or crowded gills. 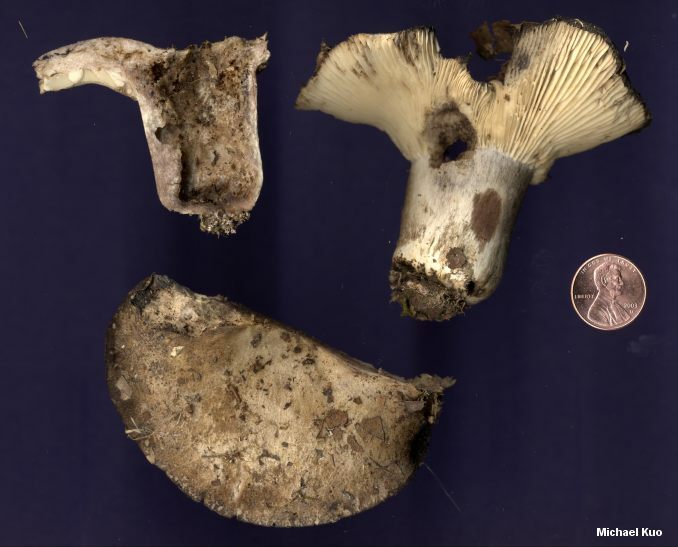 Under the microscope its spores are larger than those of the very similar Russula dissimulans--aka "Russula nigricans"--and the skin of its cap is much thicker and differently disposed (the gory details are below). That's the theory, anyway. The reality is that Russula densifolia is a classic European species, and that this area of the genus Russula is in desperate need of revision based on contemporary concepts. 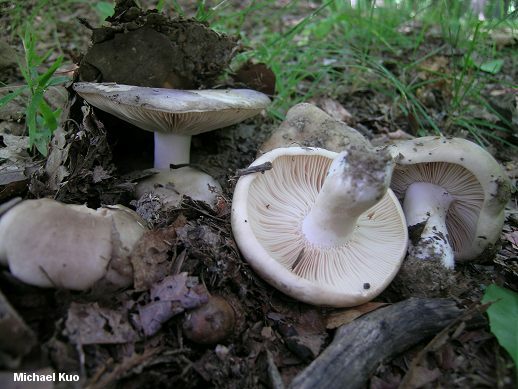 I'll bet my hat that there are at least several genetically distinct North American species in this group that have evolved as mycorrhizal partners with diverse trees in widely different ecosystems--and that the species probably cannot be reliably separated on the basis of their gill spacing, spore size, and cap skin thickness. Shaffer (1962) documents four taxonomic "forms" of Russula densifolia, based on cap colors, spore print colors, gill spacing, and tendency to grow scattered or in troops. Ecology: Mycorrhizal with hardwoods or conifers; growing alone, scattered, gregariously, or in dense troops; summer and fall (also over winter in warmer climates); widely distributed in North America. Cap: 4-15 cm; broadly convex when young, later flat with a central depression, or shallowly vase-shaped; sticky at first or when wet; more or less smooth, or finely felty to the touch; initially white but soon discoloring to brownish, ashy gray, brown, or blackish; bruising slowly reddish, then blackish; the margin initially somewhat inrolled, not lined or lined faintly and widely; the cap skin peeling easily about halfway to the center. Gills: Attached or running very slightly down the stem; narrow; close or crowded (sometimes nearly distant); white to cream, eventually yellowish; bruising slowly reddish, then blackish. 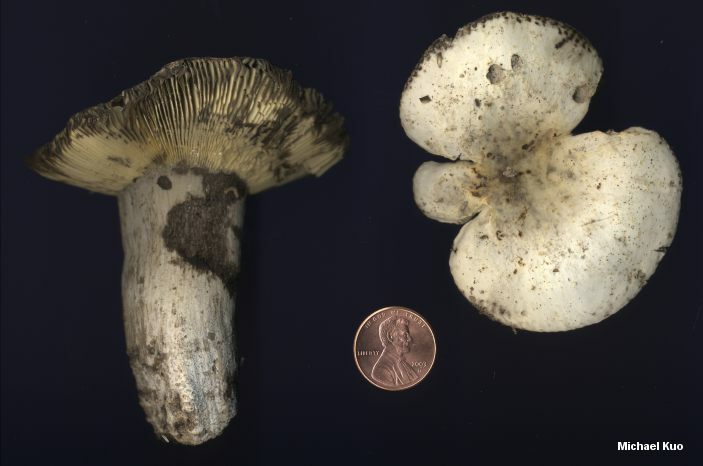 Stem: 1.5-9 cm long; 1-3.5 cm thick; white but soon darkening like the cap; bruising reddish, then blackish over the course of as much as half an hour; smooth or finely felty. 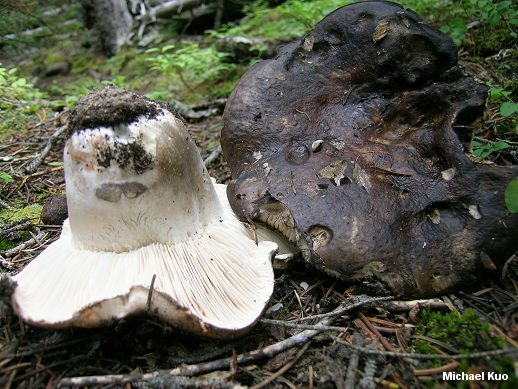 Flesh: White; hard; bruising promptly or slowly reddish on exposure, then blackish over the course of as much as half an hour. Odor and Taste: Odor not distinctive; taste mild or slowly slightly to very acrid. 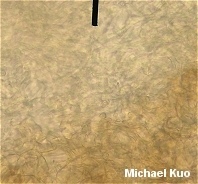 Chemical Reactions: KOH on cap surface negative. Iron salts on stem surface negative. 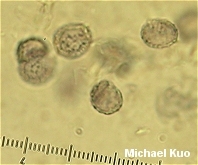 Microscopic Features: Spores 7-11 x 6-8.5 µ; elliptical to subglobose; with warts to .7 µ high; connectors usually forming partial or complete reticula. 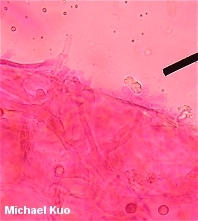 Pileipellis up to 500 µ thick; occasionally disposed as a single, cutis-like layer but more commonly two layered, with the lower level densely interwoven and cutis-like and the upper level composed of fairly erect elements embedded in a gelatinous matrix; pileocystidia absent. REFERENCES: Gillet, 1874. (Saccardo, 1887; Burlingham, 1915; Beardslee, 1918; Kauffman, 1918; Shaffer, 1962; Smith, Smith & Weber, 1979; Arora, 1986; Kibby & Fatto, 1990; Phillips, 1991/2005; Barron, 1999; McNeil, 2006; Miller & Miller, 2006; Binion et al., 2008; Roberts, 2008.) Herb. 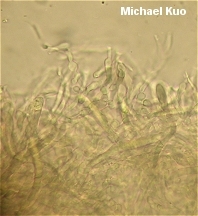 Kuo 06289502, 06150307, 08050303, 09010602, 07110705, 07160701.